There are numerous books in the market with titles such as Zen in the Art of Archery, Zen and the Art of Motorcycle Maintenance, The Zen of Painting, The Zen of Success, Zen in the Martial Arts, etc., etc. All of these books show or attempt to show how these activities can be absorbed into an all-inclusive facet of life where your whole mind and body and spirit is put into the activity; in a successful way. For the purposes of this article, 'Zen' here refers to this use of this activity of stairclimbing for sport and fitness in a Buddhist way with the whole mind, body, and spirit and not necessarily just to the 'school' of Zen Buddhism. Using sport or another activity in this way may actually have its origin in the Theravada Pali Canon; see Sedaka Sutta. The Buddha said: ‘Good health is the highest gain’ (Dhp.204) and he encouraged monks and nuns to do exercise as a way of promoting vigour and health (Vin.II,119). In the Four Foundations of Mindfulness discourse (Majjhima Nikaya 10) the Buddha states that one should maintain mindfulness when walking and going: "Furthermore, when walking, the monk discerns that he is walking . . .Furthermore, when going forward and returning, he makes himself fully alert; when looking toward & looking away... when bending & extending his limbs... he makes himself fully alert." 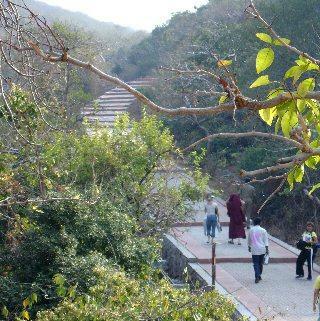 Movements like walking have been incorporated into the meditation practice at many Dhamma centers. In the same way, movements in sports can and should be done mindfully. The result will be better health and better performances. Stairclimbing especially burns many calories and provides an excellent work-out to the cardio-vascular system, promoting good health. A more fit heart beats less times during non-work-out times, which could increase longevity and provide more relaxed and better meditation sessions. Buddha was sort of a stairclimber. 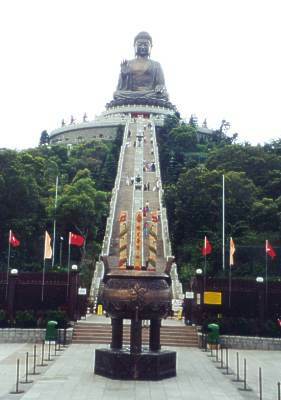 The Buddha liked to meditate at Vulture Peak and he had to climb a steep hill to get to the top. Today there are stairs up this steep hill to Vulture Peak; it is roughly equivalent to climbing 1,500 stairs. 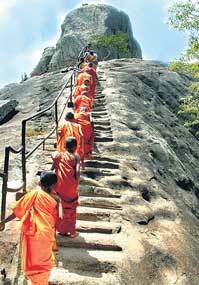 In the 10th century a King called the Maha Bodhi Temple (holiest place of Buddhism) the stairway to heaven. In October 2004, archaeologists in Austria found a stair case that is believed to be at least 7,000 years old. Stair cases have been around almost from the beginnings of civilization. Numerous other religious leaders liked to climb mountains for prayer, meditation, and to give teachings and the climbing at many of these places is virtually identical to stair climbing. Jesus taught at The Sermon on the Mount; Moses climbed Mt. Sinai, and Muhammad went to the mountains surrounding Mecca to a cave. Stair climbing races started from the various running clubs around the world in the large cities which are home to many 70 story + buildings. The sport of stairclimbing requires one to use their whole body weight, going vertically against gravity up some of the tallest skyscrapers in the world. As such, it is an excellent form of fitness using the whole body. It uses tremendous amounts of leg muscles and energy and also the hands and arms as pulling yourself up with the rails is allowed and encouraged. It is aerobic since it requires going up over 70 floors in most stair races and it is anaerobic too as the top athletes complete in less than 10 minutes, so it requires a fast speed to win such an event. One man lost 145 lbs. (66 kg) in one year by stair climbing. He now regularly competes in stair climbing races. He actually did nothing but stair climbing. He does not do running, bicycling, or any other sport or exercise, just stair climbing. Since it is such a strenuous sport, it is possible that the calorie loss is as much as double that of running, cycling and other aerobic sports. There is no study that concretely shows how many more years a person could live by engaging in aerobic exercises or sports. But there are numerous studies which show the detrimental effects of being sedentary and eating high fat diets. By using common sense and the facts gathered from these studies, we could infer that every organ, including the heart has a certain amount of "mileage" of use and then must die. If the average person's heart beats about 74 beats per minute and lives to about 85 years, this results in 3,308,288,400 total heart beats over his/her life. By engaging in aerobic exercises and sports such as stair climbing, the heart becomes a much more effecient machine, beating far less times per minute when resting. This "saves" millions of heart beats per year, which using common sense, would result in increased longevity. If a person became very fit and had an average resting heart rate of 55 beats per minute, it would take 114 years before this person "used" up his allotted 3,308,288,400 total heart beats per life. Of course, there are other factors in determining longevity, such as stress and diet, but with all other things being equal, the fit over the non-fit person could expect to live another 29 years. The sport of stairclimbing started around the 1970s and gradually has become a bona fide sport with numerous athletes competing in events around the world. In the U.S. often such events are fund raisers for various charities. There are age group prizes in male and female categories in ages typically from 18 years old through 90 plus. Medals are awarded in each age group and also for the overall winner among Men and the overall winner among Women. Here is a table of the best stairclimbing athletes of all time based on their performance in the Empire State Building race for years 1978-2012 and since that time for the annual event at The Strat Hotel and Casino in Las Vegas. Points above based on 3 points for each Gold (first place), 2 points for each Silver, 1 point for each Bronze place finish. Based on each finish in age group and additional win awarded for each overall win in men’s group and women’s group (regardless of age). Empire State Building in New York City used as the World Championship from 1978-2012 and The Strat Hotel in Las Vegas used as the World Championship from 2013 to present. These races were chosen since they are international cities and get a good international turnout of athletes. The Empire State Building is 103 floors and The Strat Hotel is the equivalent of about 109 floors. In the above table, the age group of 30s refers to the 30-39 age group, 40s refers to the 40-49 age group and so on. Chico Scimone listed above at number 3 regularly flew in to compete from Italy and won (as the only competitor) in his age group of 90-99. He passed away at the age of 93 in year 2005 having competed just one prior to that at the Empire State Building race. For athletes that have the same number of points, the higher ranking goes to the one with the faster time. This page was last edited on 3 March 2019, at 23:58. This page has been accessed 189,708 times.